You would think something as delicious sounding as chocolate mint would be a no-brainer in the herb garden. It seems chocolate mint plants come with a lot of controversy. Some gardeners are adamant that the true cultivar of chocolate mint has the scent of a chocolate mint patty candy, but others think the idea that the leaves smell like chocolate is just the power of suggestion. The plants are a cultivar of common peppermint. They have darker stems than peppermint and dark-green purplish leaves. Although the scent can very strongly suggest chocolate, the flavor is more subtle. Give it a try and see what you think. Chocolate mint is very adaptable and is reliably perennial in USDA hardiness zones 5 - 9. When in flower, chocolate mint can reach a height of 2 ft. Expect the plants to spread as far as they are allowed. Chocolate mint plants prefer partial shade. You can grow them in full sun if you water them frequently. Because it is a cultivar, you will be buying your chocolate mint as a plant. Once you have your first plant, you can take cuttings and make as many plants as you like. They will even root in water. Chocolate mint grows best in a rich, moist soil that leans toward a slightly acidic pH between 6.5 and 7.0. Top dress the soil yearly with organic matter, to keep it well draining. 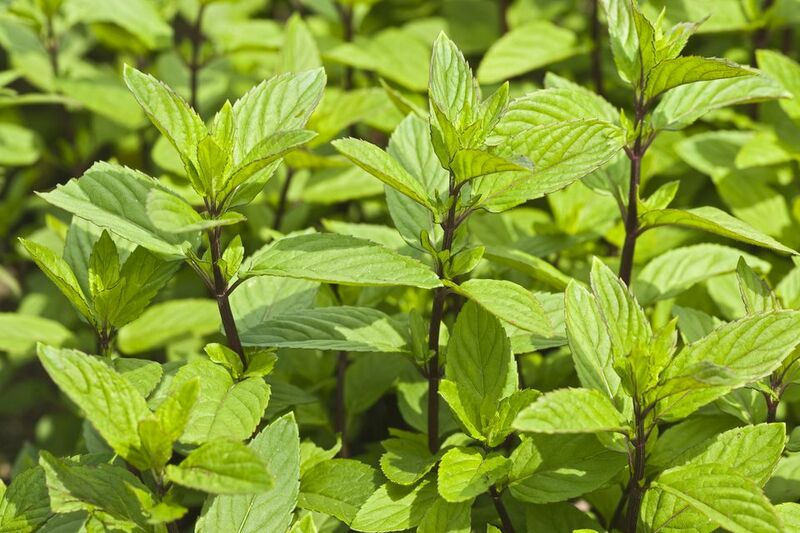 While growing herbs in less than rich soil tends to concentrate their essential oils and therefore their scent and flavor, because mint prefers a moist, woods-like soil, it’s good to add some organic matter before planting. Mint is one of the few culinary herbs that prefer partial shade. You can grow it in full sun if you provide adequate moisture. Water is crucial to growing chocolate mint well. Give it at least an inch of water per week, more if the weather is warm. While chocolate mint likes moist soil, its roots will rot if it is left sitting in soggy wet soil, so make sure the soil is well draining. Adding organic matter should help with that. Since chocolate mint is a perennial, it will benefit from a side dressing of a balanced fertilizer each spring. Don’t overfeed or you will get a lot of growth, but less chocolate scent. All mints are aggressive growers and will cover as much space as they can. Cultivars of flavored mints, such as chocolate mint, do not grow quite as rampantly as species mints, but it would still be wise to plant them in containers or with some type of barrier in the ground. You could even sink the whole container in the ground. Of course, if you have an area where you want a spreading ground cover, mints are a good choice. Give it a dose of balanced fertilizer each spring. Regularly harvest or shear the plants to keep new foliage coming in. Growing any mint in a container is a good way to enjoy the plant without worrying about it becoming invasive. You will need a pot that is at least 12 inches deep. If you use something like a strawberry pot, you can grow multiple types of mint in the one container. With its dark green leaves and stems, chocolate mint is also nice in a hanging basket. Growing it in containers means you can keep it near the kitchen for convenient harvesting. If you live in hardiness zones 3 - 5 you will need to give your potted chocolate mint some winter protection. You can try growing it as a houseplant, but indoor conditions are not ideal for mints. If you want to try, give it more sun than you would outdoors and provide some humidity in the form of misting or a by placing the container on a tray filled with pebbles and water. A better way to overwinter your potted chocolate mint is to move it into a basement or unheated garage for the winter. Give it a little water when the soil is dry a few inches below the surface and move it back outdoors when the weather warms in the spring. Mint is usually problem-free, however, it can sometimes be affected by rust, a fungal disease that manifests as small orange spots on the undersides of leaves. Use an organic fungicide and try to allow the leaves to dry between watering. Make sure the plants are not crowded and are getting plenty of air circulation. If your chocolate mint plants should become stressed, they may invite pests such as whitefly, spider mites, aphids, and mealybugs. You can begin harvesting leaves when the plants are at least 4 - 5 inches tall. This should take no time at all since you are starting with plants. Don’t take more than ⅓ of the leaves. The plant will get bushier as you harvest. The flavor of chocolate mint is best before the plant flowers. However, if your plants do flower, you can shear them back and new tender leaves will fill in. If you notice the stems getting longer and the leaves getting sparse and small, it’s a sign that harvesting has not been enough to reinvigorate your plant. Cut the plants back by one-third to one-half and the new foliage should have much larger leaves. Great sprinkled on fruit dishes.